A campfire tripod is a great solution for many of your camping cooking needs. Cooking on a campfire requires at least some equipment, but ideally you want lightweight and compact supplies which are easy to carry with you yet are very functional and will allow you to do many things. 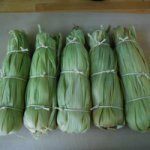 While simple camp fire skewer cooking is about as easy and compact as you can get, it is fairly limited in what types of foods you can prepare on a skewer. 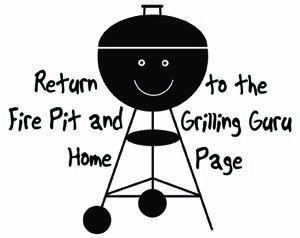 Likewise, a fire pit grill or portable grill requires carrying bulky equipment around with you which can be a big pain if you are backpacking or really camping out. Therefore, a campfire tripod is really one of the best "all-purpose" camp cooking supplies you can have! Read on to discover the advantages of a tripod as well as tips on how to use them for different styles of campfire cooking. What is a campfire tripod? A tripod is a three-legged stand which sits over your campfire or fire pit and allows you to hang various cooking equipment over your fire. Most come equipped with a chain to hang the supplies on which allows you to raise or lower the cooking food to your desired height so that you can fine tune your cooking temperature. This is advantageous because cooking directly on a large fire can be too hot for most foods. The tripod allows you to turn your outdoor fire into a multipurpose cooking site...a grill, oven and burner all rolled into one! What styles of campfire cooking can be done on a tripod? There are basically two types of cooking which can be accomplished with a campfire tripod. 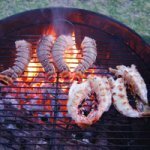 Firstly, you can use a grill on a tripod, suspended over the campfire as is seen in the pictures on this page. The grill can be lowered or raised over the fire to reach the ideal cooking temperature. Secondly, various cooking vessels can be held on the suspended grill or by the chain to cook over the fire like over a burner. These can include anything with a handle that they can be suspended from such as a dutch oven for cooking stews and soups and a kettle for heating water for coffee or tea. A tripod is relatively easy to use. Most consist of three metal rods which break down into smaller segments. 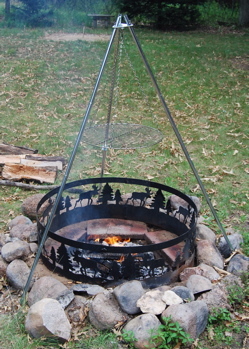 After connecting the segments the three legs are spread out in a triangle around the base of your campfire or fire pit. Finally, your cooking devices are attached to the adjustable chain hanging from the apex. This can be raised and lowered as needed to fine tune the amount of heat and fire your food is exposed to, higher for warming and slower cooking and lower for high heat grilling and searing, somewhere in the middle for simmering of stews and soups. When you are done the legs come back apart and the entire tripod can fold up into a relatively small space. Are there any disadvantages to using a tripod? While the tripod itself folds up into a compact form for storage and transportation, the campfire tripod does require other cooking utensils to get the most out of it. A circular grill grate is flat and light so is easy to carry along. However, larger kettles and/or cast iron dutch oven cookware can be heavy and bulky. While this may be fine if you are driving to your camping destination, it can be more cumbersome if you are hiking/backpacking long distances to your campsite. Finally, while both a grill and handled pots and kettles can be hung from a tripod, most tripods cannot accommodate both at the same time. 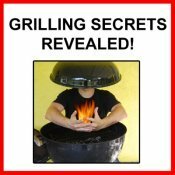 Done learning about cooking with a Campfire Tripod?